We stay cautious on the pricing factor and the price volatility, which might impact the profitability and stock returns. 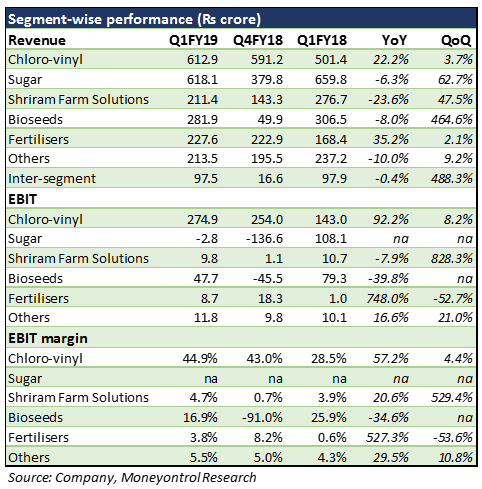 DCM Shriram reported a muted set of Q1FY19 numbers with a weak performance mostly on account of substantially lower realisations from the sugar segment, despite a 190 basis points (bps) margin expansion in the chemical business. Overall revenue grew 0.6 percent year-on-year (YoY). Operating profit contracted 4 percent on account of losses in the sugar segment, an uptick in other expenses and a surge in the power costs. Earnings before interest tax and depreciation (EBITDA) margins at 16.3 percent were flat YoY. Interest charge increased by 47 percent YoY due to higher working capital, owing to enhanced sugar inventory and delayed disbursement of urea subsidy post the implementation of DBT(direct benefit transfer). Revenue in the chemical business grew 22.2 percent on the back of a healthy 13 percent growth in the caustic soda volumes (112k MT). Earnings before interest and tax (EBIT) margin saw a strong 1640 bps expansion due to improved efficiencies post completion of the expansion projects and full utilisation of the plants. This mitigated part of the cost hike which came in due to higher coal prices during the quarter. Caustic soda prices have been following the global trend (tad softening there). The domestic demand seems strong. However, owing to additional upcoming capacity, prices might see some softening in the coming term. The management expects the growing demand to limit the impact. The price for chlorine has turned positive after consecutive quarters of negative prices. For a majority of FY18, chlorine prices remained negative, with companies having to pay to get chlorine lifted from factories. With increasing chlorine demand, this scenario improved with prices becoming positive and adding to the overall realisations, thereby neutralising the impact of low caustic soda realizations. Sugar business remained a drag eating away the overall profitability. 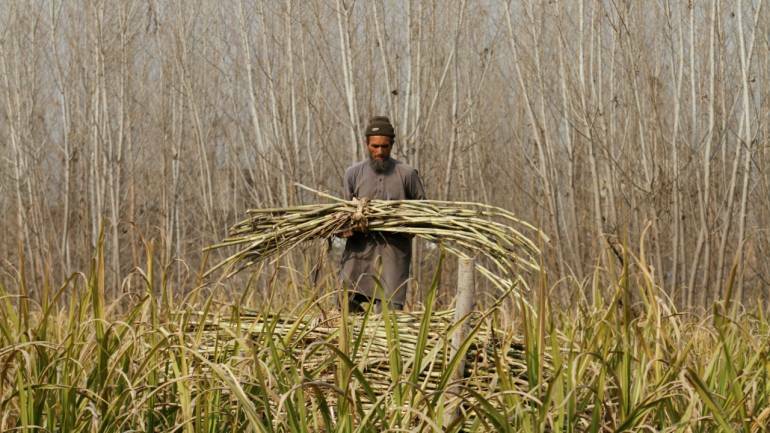 With falling sugar prices owing to a bumper sugar production the realisations dropped substantially despite a significant uptick in volumes (high sugarcane availability resulted in longer crushing season). The segment was also impacted due to the Rs 300 crore (at Rs 2,900/quintal) inventory revaluation charge by the company on account of falling prices. Overall revenue dipped 6.3 percent YoY with EBIT loss of Rs 2.8 crore. Sugar alone posted a loss of Rs 70.2 crores. However, an uptick in power segment sales along with commencement of the ethanol sales neutralised a portion of the loss. Molasses prices remained weak reaching almost zero due to abundant availability and realization were poor. New capex in the Sugar business will produce refined sugar, which will be meant only for sale to the institutional clients. Price of sugar has now moved to Rs 3250/quintal which should improve the situation in Q2. However, with the forecast of another bumper year for sugar production, the segment is expected to remain weak. Farm solutions - Farm solution business reported a 24 percent contraction in revenues during the quarter on account of low volumes. Bulk segment revenue declined by 36 percent YoY, while the value-added segment revenue declined by 18 percent YoY. This is in line with the company’s strategy to shift from bulk traded fertilizers to value-added products. Fertilizer segment – This segment saw a volume uptick of 3 percent YoY pulling up the revenue 35 percent YoY. This coupled with recent price hikes led to a strong margin expansion and substantial growth in operating profit. With the implementation of the DBT scheme the subsidy payment cycle has elongated which led to higher subsidy outstanding. This further led to higher working capital requirements during the quarter thereby increasing the interest costs. Bioseeds segment – mandatory price cuts of cotton seeds in domestic markets and lower corn seed sales internationally impacted the segment revenue and profits. While revenue declined 8 percent YoY, operating profit saw a dip of 40 percent YoY. The segment is expected to remain under pressure owing to lower margins and reduced cotton acreages in the current Kharif season. Post a sharp correction in May 2018, the stock has seen some recovery in the recent months. It is now trading 44 percent below its 52 week high, at a 2019e PE of 8.7x. The company saw a mixed performance across segments during the quarter. The business is highly dependent on global and domestic prices of commodities like caustic soda, chlorine, sugar which could have a significant impact on the profitability. With the forecast of another bumper year for sugar, we expect the segment to remain a drag. We stay cautious owing to the pricing factor and the price volatility, which might impact the company’s profitability and stock returns.